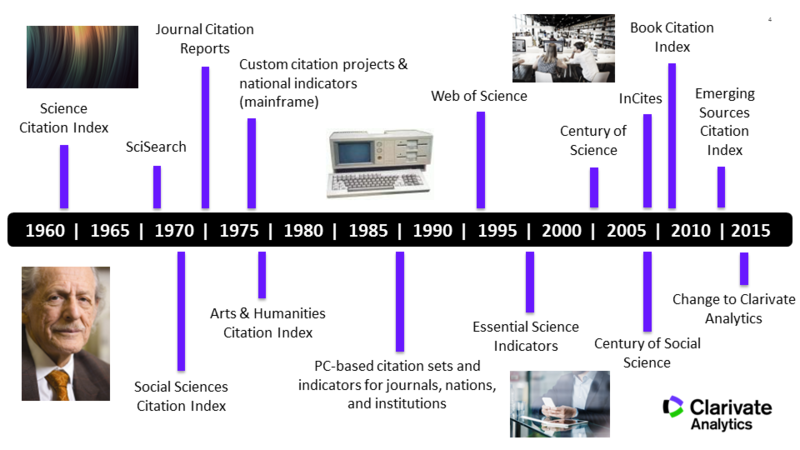 Clarivate Analytics (formerly the IP & Science business of Thomson Reuters) has been the authority on citation data for over 50 years. It all started with Dr. Eugene Garfield and the Institute for Scientific Information (ISI, started in 1957). He founded the principle of citation indexing—using citations, rather than controlled vocabulary terms, to connect works and retrieve relevant literature. This simple idea has had a huge impact in many arenas, not just bibliometrics (e.g. Google search patents cite his work). A repository of freely available publications hosted by the University of Pennsylvania. A detailed timeline of Dr. Garfield's key achievements, video interviews, and more. To honor his legacy, Clarivate Analytics has established the Eugene Garfield Award for Innovation in Citation Analysis.